Discovering the benefits of 5s can really help organizations progress quickly by delivering some fast tangible benefits to the workplace improving efficiency and promoting a safe working environment. 5s in itself is a simple but powerful tool – we’ve got a series of articles on 5s – if your just starting out on 5s check out our How to run a lean manufacturing 5s event. Thousands of organizations have used 5s to deliver real benefits. Implemented correctly 5s can tackle many business issues including cycle times, increased floor space, reduced lead times and training cycles, lowered accident rates, enhanced communication, and less inventory. 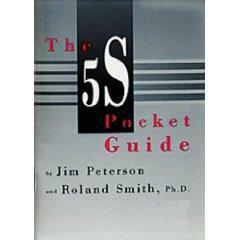 Despite it’s size the The book represents a comprehensive approach to the 5 s system and is easy to understand providing a helpful and indepth tutorial on 5s.